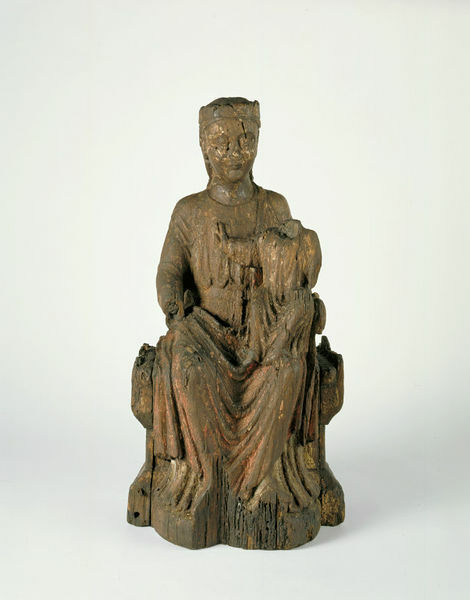 This was probably an altar figure, one of the most common forms of wooden religious image in the Middle Ages. Very few survive in England as they were removed or destroyed during the Reformation. The Virgin, wearing a low crown, sits frontally on a backless throne, with the Christ-Child on her left knee. There are a number of losses: the Virgins right hand, the head and left arm of the child (He originally held a book). The present colour scheme is approximately that of the earliest layer: the Virgin's over-mantle is red (perhaps over-patterned with white) and her under-gown is blue, while the Christ-Child's tunic is yellowish white. There are remains of pinkish flesh tones on the face and the neck of the Virgin and the sides of the throne are yellow or gold. Historical significance: The Virgin and Child group represents the transitional phase between Romanesque and Gothic, retaining recognisable twelfth century features while looking forward to the stylistic advances of the thirteenth century. English medieval figure sculpture in wood excluding effigies and misericords, is of utmost rarity. Although there can be no doubt that such figures were made in large numbers but they suffered more than stone sculptures. It has been suggested that English sculptors worked in Norway and Sweden in the thirteenth century since sculptures such as the Langham Virgin provided the model for a number of groups now preserved in Scandinavia. The importance of English wood sculpture of the first quarter of the thirteenth century for wood sculpture of this period in Lower Saxony has been recently postulated. The present piece was almost certainly an altar figure, which together with the figures forming part of a rood (Christ crucified, the Virgin and St John the Evangelist), was the most common form of devotional image in wood in the Middle Ages. Probably just such a statuette is described in the Liberate Rolls relating to to the refurbishment of the chapel of St. Peter ad Vincula in the Tower of London in December 1240: 'the small figure of St Mary with her tabernacle, the images of St. Peter, St Nicholas and St Katherine, the beam above the altar of St. Peter, and the small cross with its images are to be repainted and refreshed with good colours'. Andersson, Avon. 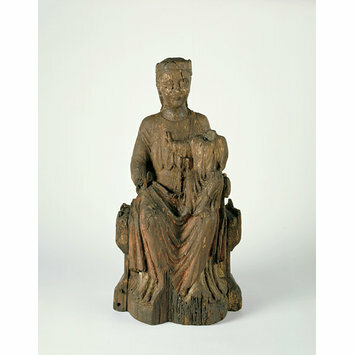 English influence in Norwegian and Swedish figure sculpture in wood 1220-1270. Stockholm, 1949. pp. 31-32.
Review of principal Aquisitions. V&A, 1925 (1927). pp. 2-3. pl. I. Stone, Lawrence. Sculpture in Britain: the Middle Ages. Harmondsworth: Penguin, 1955. pp. 104, 107, 249. pl. 78. n. 32. Suckale, R. Zur Bedeutung Englands für die welfische Skulptur um 1200. In: Heinrich der Löwe und seine Zeit. München : Hirmer, 1995. II. pp. 445, 451. no. 30. Cf. Societé francaise d'Archéologie. LXXXII. 227. ill. p. 234. Cf. Hamann, R. Article in Marburger Jahrbuch. III, 1927. p. 77. Williamson, Paul, The NACF and the National Collection of Sculpture. In National Art-Collections Fund Review,1986, pp. 77-78, fig. 1.